WURTULLA surfer and regular fisherman James Lazzaro says he won't be going into the water at his home break for a while, after a humpback whale calf washed up, ripped apart by sharks. 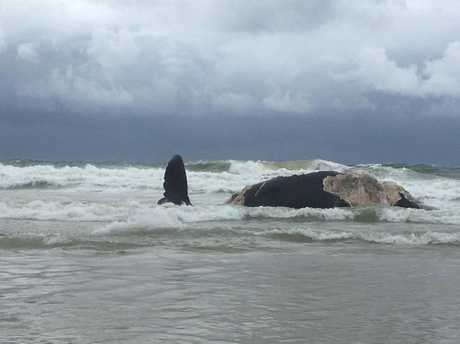 The dead whale appears to have been torn apart by sharks with huge chunks missing from the carcass languishing in the shallows of Wurtulla Beach, near the Wurley Dr beach access point. 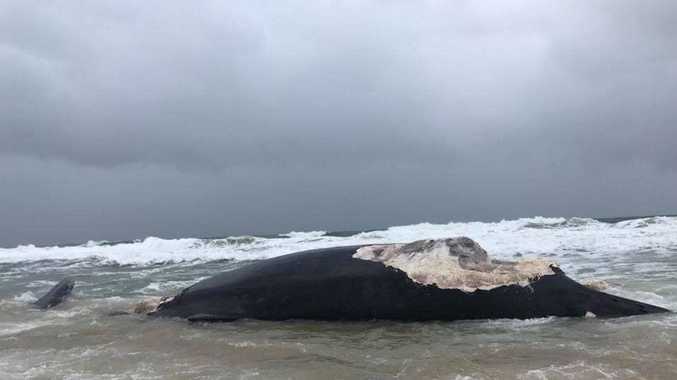 Mr Lazzaro said he'd heard about the whale and went to the beach to check it out and was stunned to see the size of the whale and the holes missing. "It's definitely been ripped apart by sharks," he said. "I won't be surfing Wurtulla for a long time." 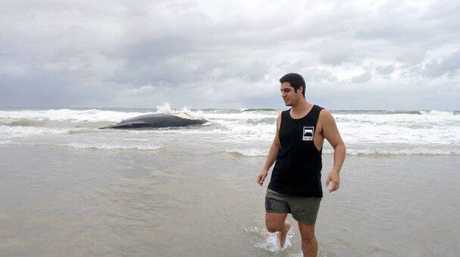 The whale is believed to have only washed up within the last few hours. Mr Lazzaro, a stockbroker by trade, said it didn't appear to be a fully-sized bull whale like the ones he sees regularly fishing in the area. "It looks like a calf," he said. He tipped the calf to be about 30m long. "The bites (taken out of it) were pretty big," Mr Lazzaro said. While he couldn't estimate how big the sharks were that would've attacked the whale, he tipped they were fairly large. "There were some pretty decent bites taken out of it," he said. He said he'd seen the odd shark around Point Cartwright, but never at Wurtulla, and it was the first dead whale he'd seen. "We've never seen a dead whale in our lives," Mr Lazzaro said. He said he hoped the authorities took the whale either well inland or a long way offshore to dispose of it, to prevent blood and offal entering the shallows, enticing sharks into the area. He said he'd only been game enough to take photos from a certain distance, as it appeared there were sharks at the back of the whale, even as it lay in the shallows, as he could see distinct 'V' lines in the water. 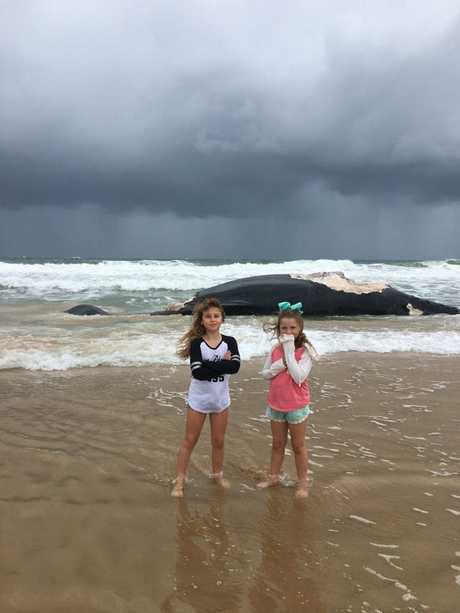 Coolum Coast Care president Leigh Warneminde said the Department of Environment and Heritage Protection needed to tow the carcass out to sea to dispose of it, but it was difficult to contact authorities on weekends to deal with dead animals on the beach. They'd had a large dead turtle washed up on Coolum Beach earlier today. "The best thing to do is to tow it out to sea," Ms Warneminde said. Jamie Carvell and his daughters, Maya and Mia, were down at the beach checking the carcass out mid-morning while the tide was lower. He thought there would've been a few sharks hovering around the body, and said it smelled "pretty bad too".